As far as I can tell, Sec. 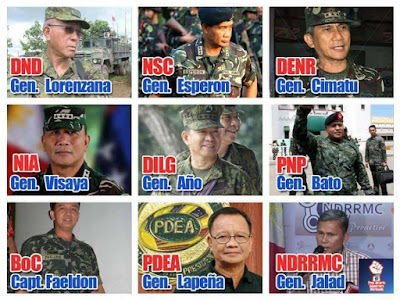 Lorenzana and Gen Ano have so far acquitted themselves very well as constitutionalist-oriented officers, curbing excesses of immature military officers and civilian officials who blur the boundaries of professionalism. I would not automatically put them as beholden to Duterte incapable of protecting the national interest." (a) Rob Ocampo: Col Alex Balutan of PCSO, Maj. Jason Aquino of NFA. (b) Ellen Tordesillas (also my fb friend): A number of retired military officers have already been given ambassadorial posts. One is Red Kapunan to Myanmmar. A friend complained about sir Doy's term, "Duterte traitorous embrace of China". I asked him what he would describe it, as "Duterte heroic embrace of China"? Pweh. On another note, the PNP has been a civilian agency for many years and decades now, how come that until now almost all of its Director Generals are from the PH Military Academy (PMA), a military agency? The PMA guys are OA, or with high sense of state entitlement mentality and insecurity, that all high positions in government involving guns and bombs should be allotted only to PMA graduates? Sir Doy replied that "Military service is also a well-structured and systematic training designed to transform a soldier into a manager and eventually into a statesman..."
I don't exactly buy this argument. Management of certain sectors require some deep technical skills then add management skills. Rather, retired soldiers have the "scare effect" on the bureaucracy down the line, making them tow the orders of the retired generals without much noise. Even legislators are somehow affected by the "scare effect" of these gun-wielding officers who used to command thousands of gun-and-bomb-wielding soldiers in the past. 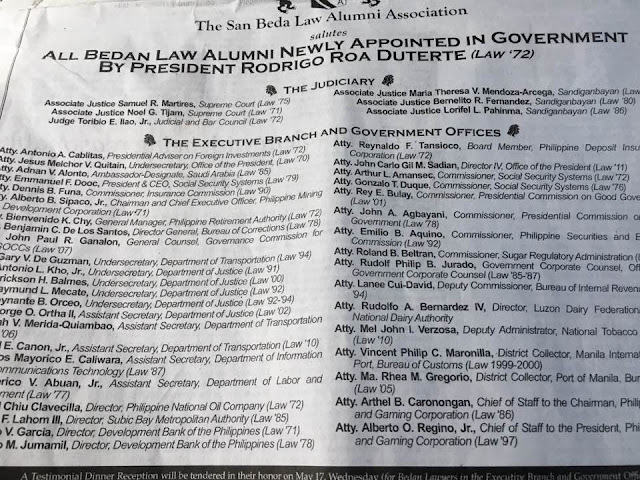 Now, aside from "over-generalization", there is also "Over-Bedanization" of the Du30 government. This is from San Beda's College of Law alone, there could be many other appointments from other colleges or departments of San Beda. I have no further comment about this trend in the Du30 government.